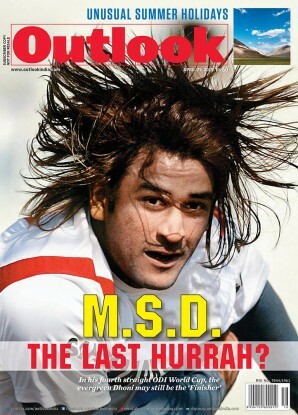 Home » Magazine » National » The Mastermind? Outlook sources records from the National Archives to see if the RSS icon had any role in the assassination of Mahatma Gandhi. Rajesh Ramachandran	September 06, 2004 00:00 IST The Mastermind? "Yashasvi hohun ya (Be successful and return)." Savarkar was Godse’s mentor: Among the exhibits submitted to the special trial court is a letter Godse wrote to Savarkar on February 28, 1938. It clearly proves that the man who assassinated Gandhi knew Savarkar for years. Their guru-chela relationship was bonded by a common ideological belief in a Hindu rashtra. Godse’s lengthy missive was written after Savarkar became the Hindu Mahasabha president. To quote from Godse’s letter: "Since the time you were released from your internment at Ratnagiri, a divine fire has kindled in the minds of those groups who profess that Hindustan is for the Hindus; and by reason of the pronouncement which you made upon accepting the presidentship of the Hindu Mahasabha confidence is felt that hope will materialise into a reality." Godse also mentioned that "we should have a National Volunteer Army" and 50,000 volunteers of the RSS were ready and waiting. Godse goes on to implore Savarkar to guide those fighting for the Hindu cause. Jamshed Nagarvala, deputy commissioner of police, special branch, Bombay, who conducted the investigations into the conspiracy, in his report noted, "Godse was devoted to Savarkar’s political ideology since 1935. He (Godse) opened the RSS branch in Ratnagiri in 1930." Such was Godse’s veneration for Savarkar that he put his portrait on his newspaper’s masthead. Godse was the editor and the co-accused Apte was the manager of Hindu Rashtra Prakashan which brought out Agrani. Savarkar chipped in by "advancing" what was then a princely sum of Rs 15,000 to fund the paper. Godse worked closely with Savarkar: A letter Godse wrote to Savarkar in 1946 establishes this. In it he talks of a Rs 1,000 cheque that Savarkar had got from Sheth Jugal Kishor Birla of Delhi. Savarkar had endorsed on it that the money be paid to Godse. The letter acknowledges the transaction. According to police records, Godse and Apte were so close to Savarkar that both travelled with him on official tours. Their last trip together was in August 1947, five months before the murder. Though Savarkar strongly denied any hand in the conspiracy, he addressed the assassin respectfully as Pandit Nathuram in his statements to the police and during the trial. Savarkar knew of the plot to kill the Mahatma: DCP Nagarvala’s crime report begins by recording the information passed on by Morarji Desai, the then home minister of Bombay Presidency. He had given Nagarvala details of the first attempt on the Mahatma’s life on January 20. "I was told by the HM that he had received definite information that the attempt on the life of Mahatmaji on 20.1.48 was made by one Madanlal with his associates Karkare and others.... He also told me that Madanlal and Karkare had seen Savarkar immediately before their departure to Delhi to attempt on the life of Mahatmaji," Nagarvala says in his report. The same day, Nagarvala got information that Savarkar was fully aware of the conspiracy.To quote from the report: "The source informed that it was at the direct instigation and instance of Savarkar that this conspiracy was hatched and plan prepared to take the life of Mahatmaji, and his pretense to be ill and out of politics was a mere cover.... Hence it was decided to immediately put a watch on the house of Savarkar." Nagarvala also recorded that the chief conspirators had a "big following of disgruntled Punjabis and some followers of Savarkar belonging to a secret organisation in the RSS". This organisation, Hindu Rashtra Dal, was heavily influenced by Savarkar’s ideology of militarisation of the Hindus. Savarkar in his statement to the court admitted that Apte, Godse and other conspirators were part of Dal. "There were several Hindu volunteer organisations to carry out the day-to-day programmes of the Hindu Sanghatan movement.... The Hindu Rashtra Dal is one of them". Savarkar stated he only "sympathised" with the Dal. Savarkar’s role in the assassination: The first attempt on the Mahatma was made on January 20 when Punjabi refugee Madanlal Pahwa exploded a gun cotton slab (an explosive) at Gandhi’s prayer meeting at Birla House, New Delhi. He was arrested immediately. At 4 pm the next day, Dr Jagdish Chandra Jain of Ruia College, Bombay, who knew Madanlal, called on Bombay Presidency prime minister B.G. Kher. He in turn sent for home minister Morarji. "I went to his room. I saw there the hon’ble premier and a person who was introduced to me as Prof Jain.... He told us that he had read about the explosion incident in the newspapers as also the name of the person who had been arrested and that he had personal knowledge of the various matters relating to that person which he wanted to narrate to us," notes Morarji in his testimony. According to Morarji, Jain knew about the plot: "He (Jain) then said that Madanlal had told him that he and his friends had decided to take the life of a great leader.... Madanlal then gave the name of Mahatma Gandhi.... He also told us that a friend of Madanlal with whom he was working at Ahmednagar had also been introduced by Madanlal to him as Karkare.... He then told us that Madanlal had told him that Karkare had taken him to Savarkar, that Savarkar had a talk with him for two hours and that Savarkar had praised him for what he had done...patted him on his back and...asked him to carry on his work." Badge’s crucial testimony: Nagarvala’s investigations led to the arrest of Digamber Ramachandra Badge, the man who had supplied the gun cotton slab to Godse and others and which was used by Madanlal. Later, Bagde turned approver and became the prosecution’s key witness. He told the court some startling facts about Savarkar’s involvement in the assassination plot. Badge was a Hindu Mahasabha worker who dealt in small arms. On January 9, Apte and Madanlal approached him for gun cotton slabs, hand-grenades and pistols. The next morning Apte took Badge to the Dal office to meet Godse. Orders were placed for two gun cotton slabs, five hand-grenades and two revolvers, and Badge was promised "any amount" on condition that he delivered the explosives in Bombay. Apte wanted delivery on January 14 at the Hindu Mahasabha office at Dadar. Badge told the police about the motive of the assassins. "Apte asked whether I was willing to accompany them to Delhi. I enquired for what purpose, whereupon Apte said that ‘Tatyarao’ meaning Savarkar decided that Gandhiji, Jawaharlal Nehru and Suhrawardhy should be finished and that this work had been entrusted to them." Badge’s next visit to Savarkar Sadan was on January 17. "Then Godse said that we all should go out and take a last darshan of Tatyarao. Apte, Godse, Shankar and myself got into the taxi and drove to Savarkar Sadan at Shivaji Park.The taxi was made to stand at the junction of the road and the lane that leads to Savarkar Sadan, and we all four alighted and proceeded towards Savarkar Sadan, which is the second building from the junction. "I was asked to remain downstairs where Appa Kasar and Damle were, and both of them, i.e., Apte and Godse went upstairs to take darshan of Savarkar. After five or 10 minutes, they both came down and as they were getting down the stairs, Savarkar followed them down the stairs and said to them ‘Yeshasvi hohun ya (be successful and return)’. On the way back from Savarkar, Sadan Apte told Badge that, ‘Tatyarao had predicted that Gandhiji’s 100 years were over.... ’ This statement of Apte coupled with what I heard from Tatyarao confirmed my belief that what was being done had the approval and blessings of Savarkar." 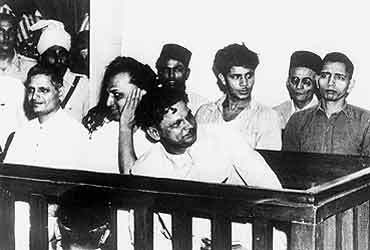 Godse and Apte flew to Delhi and Badge and Shankar, his help, reached Delhi on January 19 and went to the Hindu Mahasabha office where they met Gopal Godse, Karkare and Madanlal. The plot was to ignite the gun cotton slab, create confusion, and then throw the grenades. Madanlal ignited the slab, but Badge and his help failed to throw the grenades. Now it appears that Godse and Apte might have first wanted to get the deed done by relatively unknown people. But the attempt failed, prompting Godse and Apte to do the job. Why was Savarkar acquitted? : The first charge framed by the trial judge Atma Charan against all eight accused, including Savarkar, was that they had conspired to commit Gandhi’s murder. Curiously, he convicted all others but let off Savarkar on the technical ground that there was no corroborative proof to confirm approver Badge’s evidence. Yet, the trial judge found Badge to be a trustworthy witness. He was examined and cross-examined for 10 days from July 20 to July 30, 1948. "He gave his version of the facts in a direct and straightforward manner. He did not evade cross-examination or attempt to evade or fence any question." But, despite this, judge Atma Charan did not convict Savarkar because the prosecution case rested just on Badge’s evidence. That the conspirators had gone to Savarkar Sadan was well established. Film actress Shantabai Modak had deposed that she met Godse and Apte in the Poona Express and had dropped the duo opposite Savarkar Sadan on January 14. Similarly, taxi driver Aitappa Kotian told the court that on January 17, Godse and Apte got down from his taxi at Shivaji Park near Savarkar’s house. "The evidence of Miss Modak, which is supported by the admissions of the two prisoners, corroborates to an extent the statement of Badge," was how Justice G.D. Khosla, who wrote the judgement for the Simla High Court’s full bench, confirming the conspiracy, put it. But the prosecution had not appealed against the trial judge’s acquittal of Savarkar and hence that chapter was not reopened in the high court. Khosla had high praise for the approver who heard Savarkar wishing Godse success. "Badge has given a very full and detailed account of the circumstances leading to the occurrence and the occurrence itself.... I am of the opinion that the story narrated by him is substantially correct." The Justice J.L. Kapur Commission findings: Twenty years after the assassination, the Justice Jivan Lal Kapur commission of inquiry found that Badge’s evidence was being corroborated by Savarkar’s bodyguard Appa Ramchandra Kasar and Gajanan Vishnu Damle. Justice Kapur’s conclusion: "All these facts taken together were destructive of any theory other than the conspiracy to murder by Savarkar and his group." One may accept him or completely reject his views but to denigrate him would be like 'Stalinising' the pluralistic spirit of the nation.